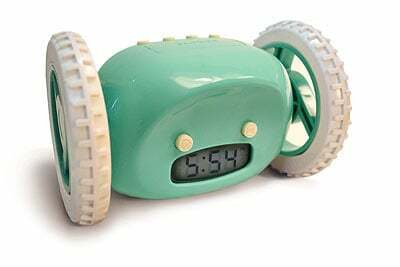 This wicked wheeled alarm clock started as an engineering student’s project. Having trouble waking up herself, Gauri Nanda developed Clocky to shriek annoyingly and effectively, waking you up. The fun doesn’t end there, kiddies. It leaps off of your night stand, and drives around your room, making random turns and racing away from your grasp. Now you have to get out of bed and hunt the little bugger down to turn it off.